Our decades of experience in providing nickel chrome plating services have honed our core competency to the benefit of our customers. Our nickel chrome plating services include kitchen appliances, barbecue grates, furniture components, food equipment, and more! By continually reinvesting in technologically advanced equipment and processes for nickel chrome plating, we keep up with the evolving environmental standards in order to meet your nickel and chrome plating requirements. Our high-capacity lines can deliver traditional nickel plating as well as a trivalent chrome finish. 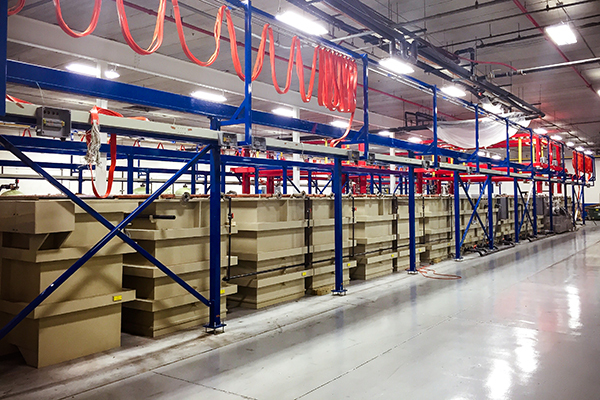 We can handle parts up to 14’ long, 3’ wide, and 4’ high, with nickel thickness ranging from 1/10,000″ to 1/1,000″. Nickel can be deposited in a dull, semi-glossy, glossy and black form. Vital to this type of application is also its strong corrosion resistance. Our nickel plating forms a thin but extremely dense, highly resistant oxide layer, rendering the metal passive against corrosion. Nickel is also resistant to many organic chemicals.